Normally peacemakers and warmongers are on opposite sides. But ironically, in the case of Iraq, the leftist peacemakers and the Islamofascist warmongers are on the same side - Anti-American. But in spite of this identity of views, when they meet, the Islamofascist warmongers kidnap the Western peacemakers when they go to Iraq, and at times they also behead them. This is a bit quizzical, but it happens. This underscores the bitter fact that the Islamofascists do not understand the language of peace. They only understand the language of blood and death. 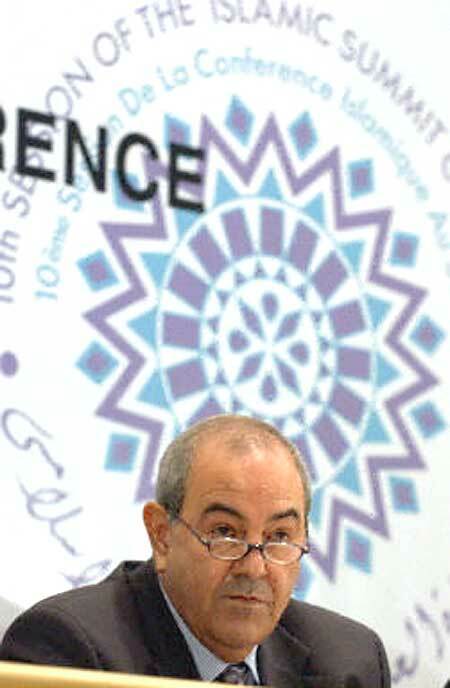 Allawi nearing the cross hairs of the terrorists bullseye? It is plain and simple that we do not want to see the Islamofascists (Shiites-Sunnis) to be a united house, an end-result that we can guarantee by making the Islamic cat rise against itself in a Shiite-Sunni war in Iraq and in the Arab Middle East and the contiguous Muslim world. A goal that would be frustated if Allawi increases his appeal among the Sunnis and secular Shiites and becomes stronger if not strong enough to be the next Prime Minister. And what is the best way to deal with those for whom bloodlust is paramount - of course it is overwhelming force. But till the time when we are not ready to use such force against them, we can make up by using shrewd and astuteness. Dealing with Islamofascists is like dealing with a wildcat. The best way to make it self destruct is to make it eat poison. Now how does one do that. One way is to stuff poison in to its mouth � that would translate in to using nuclear and neutron weapons against the Islamic world. Today this option is not politically feasible. It may become someday, after a dirty (or real) bomb explosion against the West, but today we are not ready for this option. The other option is to stuff the poison in to a cat and feed the fish to the cat. This will translate in to democratizing the Islamic world and helping this process by changing the Quran, by removing and editing the murderous chapters of the Quran. Thus purging the Quran of those passages that make the Muslims in to murderers. This option is also not feasible as the Muslim will never allow that and never accept any version of the Quran without its message of hate and murder. For them, the Quran is the inviolable word of god. This leaves us with the third option of rubbing the poison in to the cat's tail, so that with the burning sensation that the poison would cause, the cat would itself turn around on its self and lick the tail to relieve itself of the poison, and in the process consume the poison to lead to its weakening and finally its demise. This is precisely what we are doing in the Middle East. By pitting the Shiites against the Sunnis we ensure that the Islamic cat turns against itself to weaken itself and ultimately to self-destruct. In this context we would need Iraq to be led by a Shiite administration that would be rabidly anti-Sunni. It would not serve the purpose of having a Shiite leader who is capable of reaching out to Sunnis and when such a leader makes a bid for power, it would be in the interests of dividing the Islamic world against itself, to keep such a leader at bay. When such a leader tries to make electoral capital of an assassination attempt on him, it would serve our strategy of dividing the Islamic world to say that what happened during the attack may have been a publicity stunt that was stage managed to derive electoral gains. This is precisely what NBC, CBS, ABC, CNN and BBC did when Allawi was attacked at Najaf. We said that this may not have been a serious attack, if it really was an attack, subtly suggesting that Allawi could use such an attack to derive electoral gains, as he had when he said that human rights today are as bad as under Saddam Hussein. Then too we used our media and highlights statements from the Iraqi President Jalal Talebani and foreign Minister Hoshyar Zebari stating that Allawi was wrong and was making such statements only to win over the Sunnis so that he could cobble a majority after the elections.